Coin op - available as 7ft, 8ft and 9ft table sizes! The Concorde is part of the Longoni range of tables that are dedicated to providing the player with only the finest equipment available! As well as being reliable and durable, the exquisite style is made to the very highest of standards making it a luxury table perfect for use at home or in a commercial environment. With the production expertise of their European factory the Concorde is renowned for being constructed of the finest materials; wood, metals or Formica - there is a history of twenty six years celebrated performance. This experience results in only the highest quality products and exclusive design. The Concorde has a double A-grade plywood cabinet that has been finished with a non-scratch black Formica veneer. As you would expect with a table of this quality the component parts are to a high commercial standard - a precision ground Italian slate playing surface, professional cushion rubbers, a commercial grade Championship Billiard cloth and a secure service door that makes maintaining the table simple to do. This stunning table has been designed to offer the best in secure, commercial play without compromising on design. 57mm diameter Aramith Continental pool ball set. 4 x Veccio Mogano one-piece 57-inch pool cues. Black plastic triangle & 9-ball diamond. Box of 12 cue chalks. Bottle of Aramith ball cleaner. 12 spare 35mm table spots. 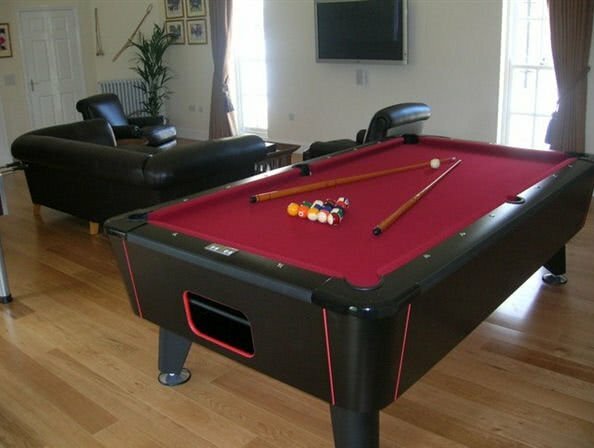 When choosing your pool table it is important to consider the size of the room or site you wish to site it in. It is recommended that there is enough room to fully extend your pool cue from the outside edge of the table to the wall. 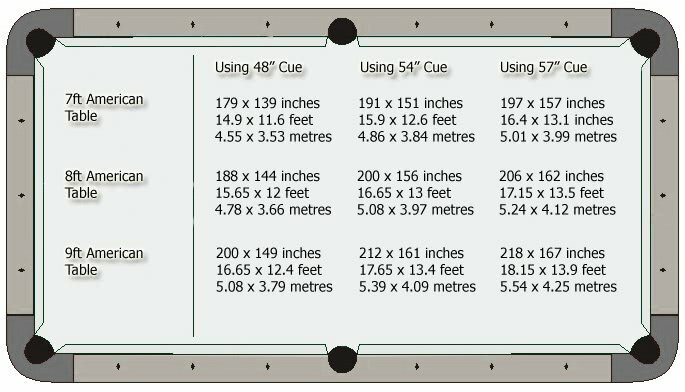 The dimensions below are an ideal size, however if space is tight why not purchase a short cue to help with any tricky shots.